My son is a freshman at OU this year, but he is in the College of Fine Arts, so at least he got to come home for a long weekend. We live in TX now, but we are all Yankees in our hearts. How cool, you have a son here in town! I am sure he is enjoying the break, the weather here turned pretty bad all of a sudden, it’s raining hard…. So you had chili too! What a coincidence! The original recipe in Gourmet made double amount, way too much just for the two of us, so this batch was enough for a very substantial dinner and two light lunches. Perfect! Texas is gonna win. And it’s your fault. I have resisted that book for ages as I have a series of Gourmet from 86-2006 and I always wonder how many recipes are duplicated if any in the The Gourmet Cookbook. That chili sounds good to me. This sounds perfect for a fall day and a football game. Have a great weekend, and a nice trip home! I agree that too much importance is placed on college athletics, much to the detriment of academics and research.To me, the recruitment and retention of quality faculty is more important than the recruitment of athletes. Do Harvard, Yale, etc. even have football teams? LOL, Cindy, my daughter and husband are Ivy alums, and yes, Harvard, Yale and the other Ivies have football teams, but they only count to the Ivies and no one else. It’s most amusing to me. 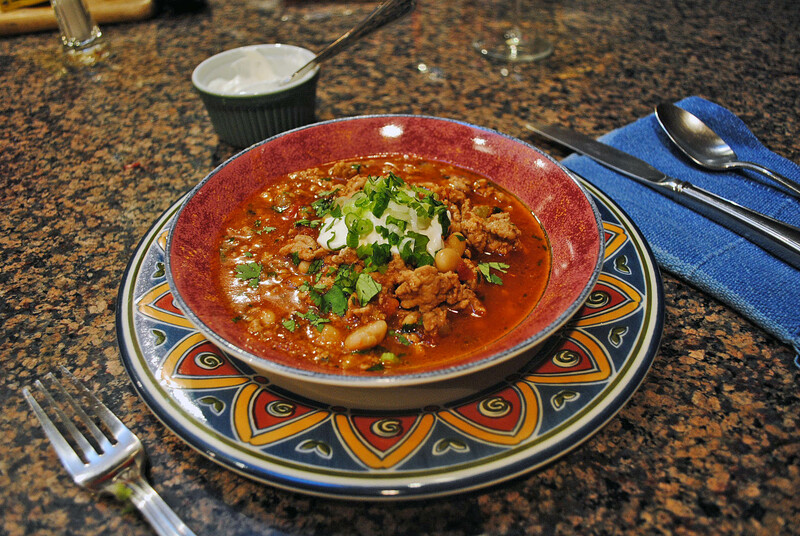 It’s probably a coincidence, but neither of them likes chili, either, though Sally’s version does look delightful. Oh that’s super spicy. Looks just great! I was surprised to realize there was no chili powder in the recipe, but the chipotle peppers and the serrano bring more than enough heat. It mellowed down quite a bit in the fridge. Sally, I love that you are into football – this is big sport in the US, yes? Is it the top spectator sport? 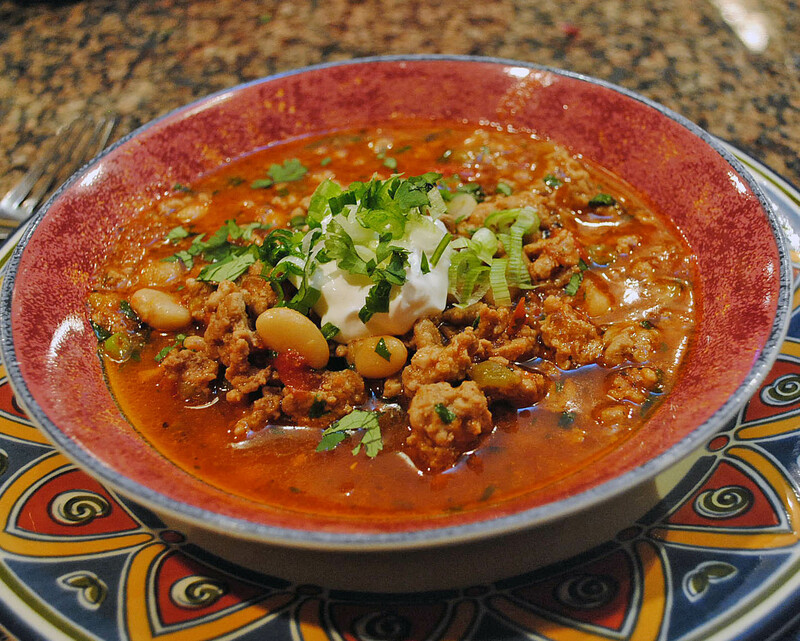 I’m really liking this turkey version of chili and the fact that you’ve added some delicious white beans too. So hearty and fall perfect. And you know I’m in for the chipotle! Love the title of your post!! Love college football – the professional football I’m not too wild about, used to root for the Packers because their colors are green and yellow (colors of Brazil), and I was very fond of their quarterback, Brett Favre. Looks like that I will have to give it a try!!! Even though my team is getting close to yours! ROLL TIDE!!!!!!!!!! Miss you in the forum! Watching football and eating chilli just goes together! And I love to read all the various ways people make their chili. I seem to always change my recipe around depending on what I’ve recently read!